Off/On: Click the lightbulb icon to toggle visibility of all objects on the selected layer. AutoCAD doesn’t regenerate the drawing when you turn layers back on. On the other hand, frozen layers don’t regenerate while you’re working on the drawing. Freeze/Thaw: Click the sun icon to toggle off visibility of all objects on the selected layer. Click the snowflake icon to toggle visibility on. AutoCAD regenerates the drawing when you thaw layers. Lock/Unlock: Click the padlock icon to lock and unlock layers. When a layer is locked, you can see (but not edit) objects on that layer. You can rearrange the column order within the Layer Properties Manager by simply dragging and dropping the column label to a new place. And you can right-click any column label to display a menu from which you can turn columns off and on. Off/On and Freeze/Thaw do almost the same thing — both settings let you make objects visible or invisible by layer. Very early releases had only Off/On. The difference is that frozen layers effectively don’t exist temporarily, so AutoCAD ignores them when regenerating the drawing. Normally, it’s faster and easier to turn layers off and on, freeze and thaw them, and lock and unlock them by clicking the appropriate icons in the Layer drop-down list on the Ribbon instead of using the Layer Properties Manager Palette. Create layer states. Say you have a floor plan of a house that includes a layer showing the plumbing and another layer showing the wiring. You’d probably never show both elements on the same drawing, so you’d need to manage some layers to show the drawing to plumbers or electricians. Rather than turn off a dozen layers and turn on another dozen layers when you want a different view in the drawing, you can save groups of layer settings as a named layer state. Click the Layer States Manager button in the Layer Properties Manager to open the Layer States Manager dialog box. Fade objects on locked layers. AutoCAD fades objects on locked layers, giving you a truly effective visual reference without confusing you about which layers might be locked. You can control the amount of fading by setting a nonzero value for the system variable LAYLOCKFADECTL. You can turn off fading but retain the current setting for future use by adding a minus sign (–) in front of the fade value, or you can turn off the fading altogether by setting this value to 0. The LAYISO command incorporates the same layer-fading feature, and it locks the layers. Set it up the way you want by entering S (for Settings) at the command line and pressing Enter; and then type the option letter for the specific settings you want. Look up LAYISO in the online Help index for more information. A group filter is a subset of layers you choose (by dragging layer names into the group filter name or by selecting objects in the drawing). A property filter is a subset of layers that AutoCAD creates and updates automatically according to layer property criteria that you define (for example, all layers whose names contain Wall or whose color is green). To find out more, press F1 in the Layers Properties Manager palette, and click the New Property Filter hyperlink. 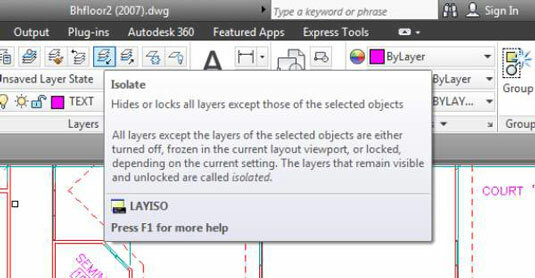 For more information on layers, open the online Help system and search on controlling layers manager. Hide or isolate objects on a layer. Rather than turn off a layer when only a few items are in the way, you can hide or isolate individual objects by using the ISOLATEobjects and HIDEOBJECTS commands while maintaining normal visibility for other objects on the layer.